Cloud Based Avro Transaction Handler (ATH) is ITC Systems’ latest solution for aggregating all terminal traffic both on and off campus. High Availability, Cloud Based Avro Transaction Handler (ATH) is ITC Systems’ latest solution for aggregating all terminal traffic both on and off campus. Using industry compliant TLS 1.2, ATH routes all terminal traffic to your local netZcore server on a single encrypted channel. 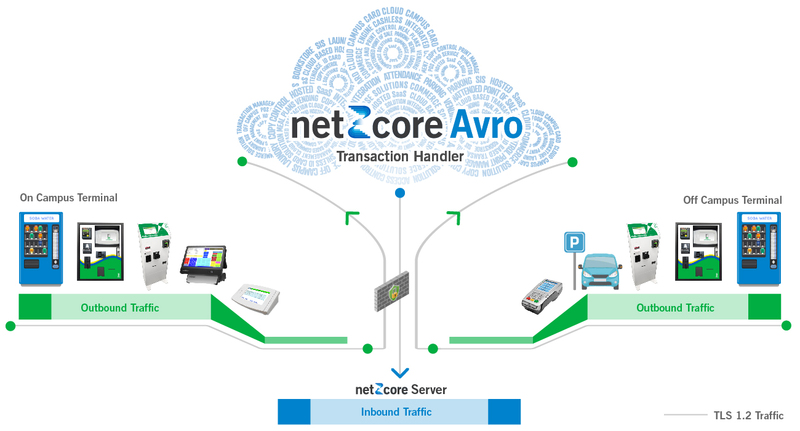 Routing traffic through the ATH is the first step in transitioning to netZcore Avro. Avro Transaction Handler (ATH) is the secure cloud platform for terminals and point of sales systems connecting to netZcore running locally or in the cloud. ATH aggregates traffic and delivers transactions to netZcore by a single IP address, allowing local firewalls to tighten security. Terminals connect to netZcore without transaction fees, lowering overall cost of service.